What’s gray, gelatinous, virtually calorie-less, and almost tasteless? Konnyaku! But before you get up and abandon this soliloquy, rest assured that, although it is virtually tasteless when eaten unadulterated, it adds great presence to cooked dishes, and also expertly absorbs the flavor around which you place it. Konnyaku is made from the root of what is known in English as the “Devil’s Tongue” plant. When flowering, it looks like a tongue, maybe sort of, but let’s stay focused on the eating and less on the aesthetics. Mashing up the roots with water, flour, and a bit of hijiki (a type of seaweed which lends its brown color to the effort), gives you a nice block of konnyaku. You can cube it, or even cut it into strips and tie it into a bow if you want! It’s also available in thin, noodle-like strips. 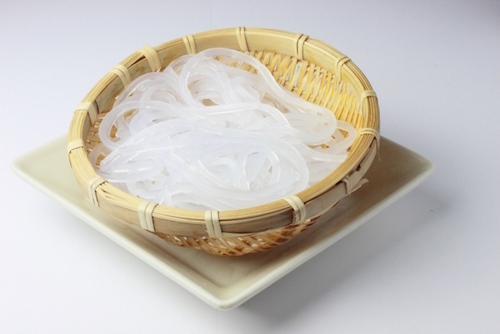 These konnyaku noodles are called shirataki, and they are a pale, translucent pearl white due to the omission of the hijiki. Konnyaku can be very stealthy like that. Be it cut into cubes or in noodle form as shirataki, konnyaku makes for a great addition to nabe, or hot pot dishes. The bolder the soup flavor the better! Konnyaku often also finds its way into the great cauldron of oden, a dish of simmered vegetables and meats often eaten during the colder months. Konnyaku is also great with a miso sauce on it, or accented with sesame oil, soy sauce, Japanese rice wine, and even a bit of shichimi (peppery seven spice blend) should you please! For those wishing to fill their stomachs with something low in calories, konnyaku is here to answer your calls. A 100 gram of konnyaku — and that’s a healthy little brick of it — has less than seven calories. Not seventy. Seven. With low calorie content, a pleasing (if different) texture, and spectacular versatility, konnyaku is a winner!